This London character and scene collage Foil picture maker is part of a range of fantastic Activity books kits available from Elgate Products. 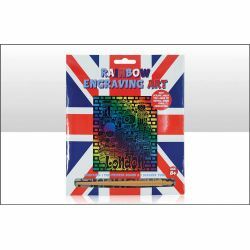 These are fun for children, creating this fantastic art piece, by simply scraping away to reveal your London icon foil engraving picture. This engraving kit is ideal for children of 8 years and over, with faint guidelines already printed on the picture to use as a guide. Contains small parts which may cause a choking hazard. This product contains functional sharp edge, use under supervision. Exclusively designed by Elgate Products.